For trade professionals and their homeowner clients in Bloomington, Minnesota, there is only one choice when it comes to accessing the highest-quality home improvement and commercial products at low, wholesale prices—ProSource® of Bloomington. We have been in business for more than 20 years. During that time, we have provided the products and service needed to make remodeling projects a success. When you begin a home improvement project, you can turn to us for expert advice on designs and assistance in finding the right product for your needs. No matter the budget, we have something to fit every project. Browse a stunning selection of flooring, bathroom, and kitchen products at ProSource of Bloomington. Attention Interior Designers: ProSource of Bloomington is a proud member of the American Society of Interior Designers (ASID). Learn how partnering with us can be bolster your business. Who Is ProSource of Bloomington? We are able to offer the incredible pricing that we do because we are part of the ProSource Wholesale® network of 145 locations. Tapping into this incredible buying power means we can offer you low pricing on the top brands you trust. When you visit ProSource of Bloomington, you will immediately realize that we are far more than a showroom. We have been in business for over two decades because the community knows they can trust us for all their home improvement needs. Make ProSource your one-stop-shop for projects big and small. At ProSource of Bloomington, we provide a vast selection of floorcovering products, including hardwood, carpet, tile, laminate, and vinyl. Plus, we carry bathroom and kitchen remodeling products such as sinks, showers, countertops, cabinets, vanities, and more. Whether you need help with your design plans or you know exactly what you need to pick out, we can help you find the right products for your budget and style needs. 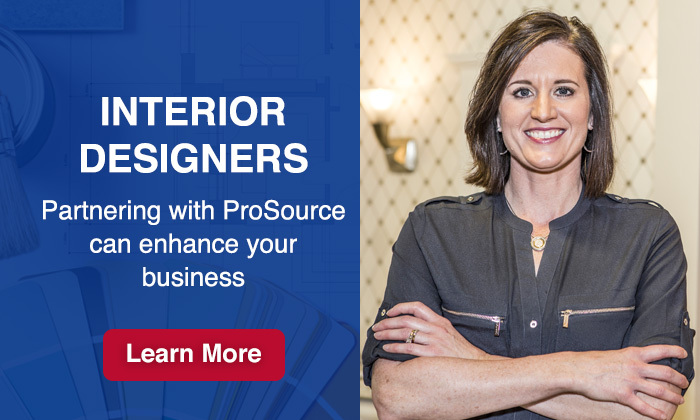 ProSource is a resource for everything needed to make a home improvement project successful. From design experts on staff who can walk you through the best use of space to our showroom specialists who can guide you to the exact product you need, we pride ourselves on the outstanding service we provide. We hope to see you soon at ProSource of Bloomington. Come find out what makes us the one-stop-shop for your next home or commercial improvement project. At ProSource® of Bloomington, you’ll have a dedicated account manager who will be your partner on every project… listening to your needs, and guiding you throughout the selection and purchasing process. It’s what you deserve—personalized service. ProSource is dedicated to the success of our trade pro members and to simplifying the home improvement process for homeowners. From start to finish, we’re here to help with the complete project, turning dreams into reality.